After the excesses of the somnolent summer, many people go on FebFast, a month without alcohol – and, it being a leap year, one day extra in 2016. The writers of these signs would be aghast. The Household, Income and Labour Dynamics in Australia (HILDA) survey is an Australian household-based panel study which began in 2001. HILDA data, when weighted, describe the Australian population (excluding those not living in households). The latest HILDA Report provides fascinating insights into Australian society and life. To be really happy in Australia, it seems the best chance is to be an unpartnered woman with kids. You will need to live in a smallish town in Queensland and get to know the neighbours. But, please, don’t smoke and don’t drink any more than 42 glasses of wine a week. With respect to education, the report revealed growing disparity between the prospects of male and female students, those with university qualifications and those without. The road to happiness and health – click image to go to Fairfax video. The report suggests that education has little effect on employment participation of men, be it in any (part-time or full-time) job. By contrast, employment participation of women — especially full-time employment participation—does appear to be significantly higher for the more highly educated. In particular, a diploma or higher educational qualification is associated with an approximate 10 percentage points or greater increase in the probability of full-time employment compared with maximum educational attainment of Year 11 and below. For neither men nor women is there a significant association between university grouping and employment participation. Earnings of full-time employees are clearly more strongly related to level of educational attainment and university type. 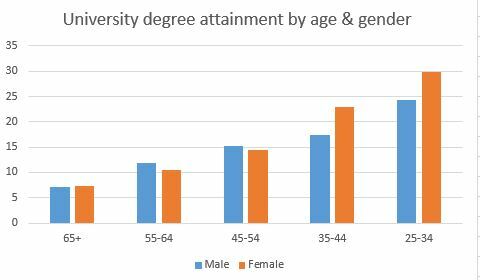 For example, compared with attainment of Year 11 and below, a master’s degree or doctorate increases earnings by 47.1% for men and 42.1% for women, a graduate diploma or certificate increases earnings by 44.5% for men and 34.8% for women, a bachelor’s degree increases earnings by 40.7% for men and 31.9% for women, and a diploma or advanced diploma increases earnings by 28.9% for men and 8.4% for women. A Certificate Level 3 or 4 is also associated with a 19.3% increase in earnings for men, but no significant increase in earnings for women, while completion of high school is associated with an 18.6% increase in earnings for men and a 14.5% increase in earnings for women. The estimates also suggest there is an earnings premium attached to Australian Technology Network (ATN) and Innovation Research University (IRU) universities. 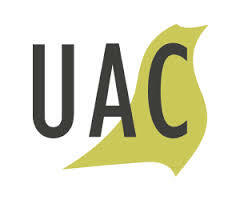 For example, there is an approximate 10% premium to obtaining the highest qualification from an ATN university as opposed to a Go8 university, and an approximate 15% premium to obtaining the highest qualification from an IRU university as opposed to a Go8 university. No significant earnings differences are evident between Go8, Regional Universities Network (RUN) and overseas universities for men or women, but relative to the ‘other’ Australian universities, all three of these groups have an earnings premium of approximately 20% for men, and an earnings penalty of approximately 13% for women. Regardless of the institution, degrees still carry big income power, with a university qualification holder being able to expect to have their income boosted by up to 42% for men and 32% for women, highlighting the continuing inequality between the sexes, where 6% more women now obtain degrees than men, reflecting a “societal shift”, according to the report’s author Professor Wilkins. The report also found that computer literacy was directly related to earnings, with those males who had high computer literacy earning up to 25% more than their less skilled counterparts. For women, low computer literacy meant a potential 12% deficit in earnings. 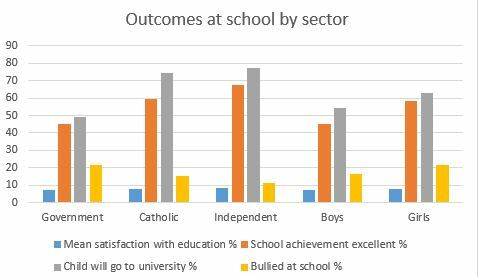 As to schools education,the published report doesn’t actually provide any data or commentary but the table below (adapted from data published by Fairfax Media) shows that while satisfaction with government schools is on a par with Catholic and independent schools, government schools nevertheless lag considerably on the perception of school excellence and on aspiration for university level study. Wilkins told Fairfax that parents and guardians on average report worse educational outcomes and prospects for boys, the notable exception being the experience of girls being bullied in high school. Funding has been guaranteed for 16 waves, and the survey is expected to continue beyond wave 16. Data releases occur at the start of December. The release in December 2013 was for data collected from 2001 (wave 1) to 2012 (wave 12). HILDA data, when weighted, describe the Australian population (excluding those not living in households). The latest HILDA Report, compiled and written by Roger Wilkins at the Melbourne Institute of Applied Economic and Social Research, showcases key features of the HILDA Survey data. NAIDOC stands for National Aborigines and Islanders Day Observance Committee. Its origins can be traced to the emergence of Aboriginal groups in the 1920′s which sought to increase awareness in the wider community of the status and treatment of Indigenous Australians. NAIDOC Week is held in the first full week of July. It is a time to celebrate Aboriginal and Torres Strait Islander history, culture and achievements and is an opportunity to recognise the contributions that Indigenous Australians make to our country and our society. That’s a bit rich coming from a government that has axed the carbon tax, tried to increase university fees and hopes to cut youth welfare. It’s a bit rich coming from a government that doesn’t have a thing to say about Australian housing policy or the superannuation concessions that largely benefit older and richer Australians. It’s also a government that is quite evidently lukewarm on the fundamental intergenerational issue of our time, perhaps all time: climate change. The following clip narrated by Julia Roberts is from a series produced by Conservation International featuring celebrity actors giving a “voice to nature”. As members and senators gather in the Parliament today, they should all make their way to the public gallery where an issue of Magna Carta dating from 1297 is on display and ponder its significance as the foundation document of our form of democracy. They might reflect, as Human Rights Commissioner Gillian Triggs observed, that the great principle of Magna Carta “supremacy of the law over the sovereign – or in today’s parlance, executive – government is under threat in our democracy.” But the 800th anniversary of the Magna Carta sounds a warning: Parliament cannot ride rough-shod over the basic rights of citizens, writes Geoffrey Robertson. It’s not just bleeding heart lefties who are concerned: I would never have believed I could agree with senator Cory Bernardi on anything but I couldn’t agree more that plans to empower the immigration minister to strip suspected Australian terrorists of their citizenship is “absolutely wrong” and “dangerous power creep”. Exactly 800 years ago on Monday 15 June, bad King John slid through the mud of Runnymede island in the Thames to affix his seal to a document drawn up by the feudal barons with whom he had been feuding. By that act, this hitherto absolute ruler (or sovereign) conceded that his power was limited by the law – the legal rights set out in Magna Carta, the great charter. He ripped it up just eight weeks later, but it was reissued by later kings of England and copies were sent around the country to reassure their subjects. Few copies survived, although one was controversially purchased by the Australian government in 1951 for £12,500 (it is now worth at least $25 million) and is displayed in Parliament House Canberra. What does it mean for Australia today? Magna Carta stands for the proposition that sovereign power (which now resides in our elected government) is limited: that government is not above the law. Nor can Parliament, however democratically elected, ride rough-shod over certain basic rights that belong to citizens. Popular majorities (Adolf Hitler, after all, was democratically elected) cannot trash certain rights that are implied from our Constitution. Those rights, in Magna Carta’s felicitous phrases, include that of fair trial, (“to no man will we sell, to no man will we deny or delay justice or right”), habeas corpus i.e. the right to challenge the lawfulness of detention and jury trial (“No free man shall be imprisoned … except by the lawful judgment of his peers”). Back in 1215, these “rights” were mainly for the barons. But Magna Carta was reinterpreted and reimagined in the 17th century, in the course of Parliament’s heroic struggle against the Stuart kings who believed themselves anointed by God as absolute rulers. A great chief justice, Edward Coke, sacked by the king for ruling against his interests, wrote a book which convinced generations of lawyers that Magna Carta was part of the common law, and guaranteed the independence of the judiciary as guardians of the limits of the king’s power. Then “Freeborn John” Lilburne, leader of the “Levellers”, popularised the charter as the mainstay of the rights of common people. When Parliament finally won the Civil War, the first act of its great generals, Oliver Cromwell and Colonel Fairfax, was to proclaim Magna Carta. Of course, some years later, when Cromwell himself developed dictatorial powers, his affection for the great charter was not so great: “Your Magna Farta cannot control actions taken for the safety of the Commonwealth” he snapped at lawyers using it to free opponents from prison. Magna Carta became law in Australia on January 26, 1788, when Governor Arthur Phillip, by raising the Union Jack on the foreshores of Sydney Harbour, thereby (under imperialist legal theory) imported into the whole country as much of British common law as was capable of application to its conditions. Not all its principles were applicable to a penal colony – it would take many years and many disputes before trial by jury could be established. But its establishment in Governor Maquarie’s time was the result of the “Magna Carta demand” by the emancipists (freed convicts) against the wealthy “free settlers”. America’s founding fathers venerated Magna Carta and included its principles in their bill of rights. But come federation, our founding fathers were men who thought like Pauline Hanson and feared that “rights” might be claimed by what they termed “coloured peoples” and by Aborigines (whom they did not regard as people). The only express Magna Carta right is in Section 80 of the Constitution: “The trial on indictment of any offence against a law of the Commonwealth shall be by jury”. Although Chief Justice Garfield Barwick once degraded S.80 as “a mere procedural provision”, today’s more rights-minded judges would be likely to rediscover it as a constitutional guarantee. 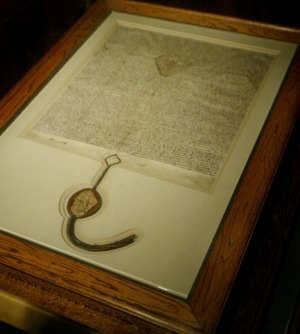 The enduring importance of Magna Carta principles is that any government ignores them at its peril. “To no man will we deny justice” has inspired access to the courts through legal aid schemes, judicial review of administrative actions and so on. “Justice delayed is justice denied” remains a potent forensic aphorism against lazy or unfair prosecutions. The High Court has developed a doctrine that rights fundamental to democracy may be drawn by implication from the Constitution. Magna Carta expresses some of these rights: its whole point is to enable citizens to live under the rule of laws that curb the power of the sovereign to abuse them, notwithstanding that the “sovereign” is not bad King John but an elected government with its parliamentary majority. So for the Australian Parliament, the 800th anniversary of the Magna Carta, a copy of which hangs in its Great Hall, should be both a source of pride and a note of warning. Pride, because the Great Charter was the banner under which courageous MPs overthrew absolutist kings and first established a form of representative government, way back in the 17th century. But a warning, too, in a country where Parliament is now the sovereign, that any attempt to pass laws that deny to the people the rights which “Freeborn John” extrapolated from the Great Charter – to jury trial, access to justice, free speech and to call government to account – will be struck down by the High Court because they are rights which may now be implied from the Australian Constitution. You cannot have a true democracy without Magna Carta’s guarantee of the rule of law. As Canberra celebrates the Magna Carta, in some quarters piously, the government would do well to meditate upon particular sections within it. Unlike other hopelessly antiquated injunctions, these seem as if they were written yesterday. 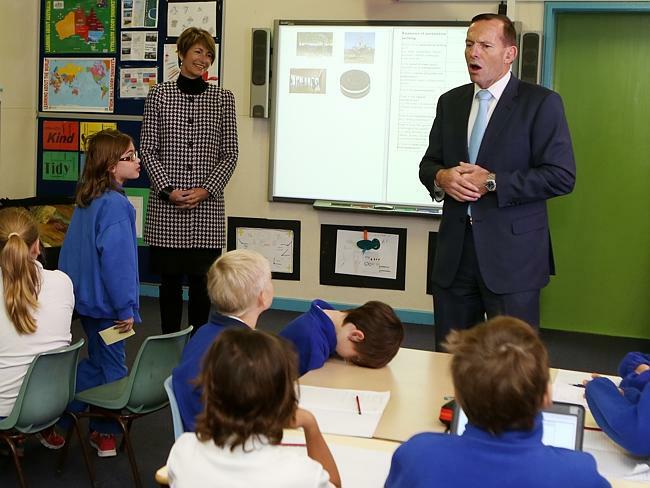 They speak directly to Triggs’s concerns about swollen executive power. An Australian Desperado Manifesto for This Year, 2015. We have plumbed new depths, and not just within the context of our own political history. The UN condemns us. Our allies shake their heads in embarrassment. Nazi nutters see us as a shining light. Amanda Vanstone and Corey Bernadi are voices of reason. Everyone is yelling.